In the Old Testament, the Song of Songs is an ode to love – a series of lyrical poems in the form of a dialogue between a woman and her lover that is often attributed to Solomon. The late scroll is the only text in the Bible which celebrates sexual love. Neymann’s 2015 film borrows this title for her gracious and poetic portrayal of two children growing up together in a Jewish shtetl in turn-of-the-century Russia. The film is based on the eponymous novel by Sholem Aleichem, who writes in Yiddish. The story is set in 1905, a dangerous time for Hassidic Jews in this part of the world, as pogroms and other violence against Jewish citizens were frequent. But Neymann’s film only skims briefly over that grim subject, notably through the worrying letters received by Skimet’s parents. Violence is mainly used as fuel for the passions in the love story between the two young protagonists Buzya and Skimet. The Song of Songs is traditionally recited at Pesach, an important moment in the Jewish calendar. 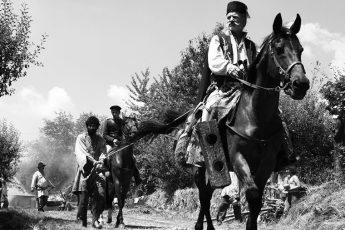 In the film it is during that feast that protagonist Skimet comes back to see his true love, Buzya, for what will probably be their last meeting before she is to become someone else’s bride. Rimvydas Leipus’ cinematography portrays the characters with gravity and sensuality at once. The two children live in houses opposite each other, both having an ethereal beauty which implies wisdom. Indeed, the film is highly stylized and constantly has Shimek and Buzya face the camera – when she plays the harp or weaves, he sits in contemplative silence next to her. In this excerpt we find both hands and feet, the fragile and much-used extremities that carry such a special special significance in the Jewish religion. The woman has already washed her feet to get into bed, a common practice amongst Hassidic Jews, who traditionally wore sandals around the house and would therefore wash their feet before going to bed. Hands, on the other hand, have a highly sexual significance in this text, although myrrh was traditionally smeared on the walls of newlyweds’ bedrooms, meaning that the text is not fully explicit, resorting to circumlocutions instead. Already in the first few scenes bare feet figure as a sensual sign in an otherwise restrictive environment. In the montage which introduces the audience to Shimek’s family, we first see his mother who walks gracefully around the room. Next, tiptoeing feet appear under a large white sheet which turn out to belong to the young protagonist who’s carefully making his way across the room. Then we see Shimek’s grandfather, who is loudly crying out for his shoes, his withered feet dangling a few inches above the shoes he cannot see. Lastly, a long and fascinating market scene introduces us to a small shoe store – through a mirror on the ground we catch a glimpse of Skimet’s bare feet another time. Gradually the two pairs of hands come into focus as well, as Shivek takes Buzia’s hand in a rhapsody of hand-holding which carries on throughout the film. In other scenes, Buzia carefully cleans Skimet’s hands, or they reach for each other holding out ripe blackberries high up in a tree. There is a build-up of melancholy present throughout this film that is sustained by the mindful choice of both images and words. When trying to convince her to stay with him, Skimet tells Buzia, “Here is my Song of Songs”, all the while knowing they can’t be together. Neymann leads us from a bright childhood into a sober present. The childhood images are ever so slightly overexposed in a hazy brightness, whereas the grown-up scenes are slightly underexposed, as if to represent the sadness that darkens our vision once love has been lost. Thus Skimet’s Song of Songs is an ultimate expression of an innocent, religious and pure love, a love expressed only by touching feet and holding hands.